Magic, music and mayhem are features in the fabulous fantasy musical, Hundred Year Rock. 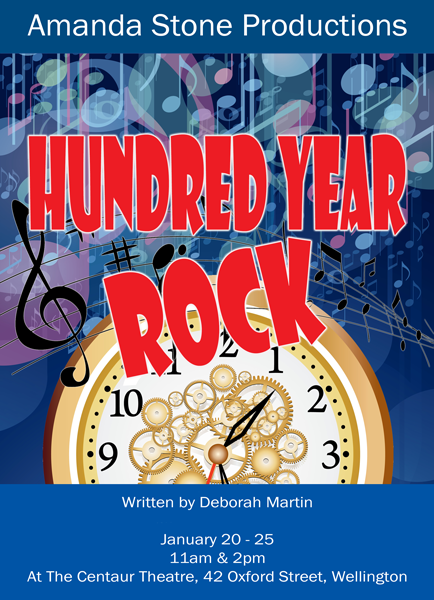 Featuring eight scenes and eight splendid songs that can be sung as solos or with an entire chorus joining in, Hundred Year Rock tells the story of a princess who awakens from a one hundred year slumber. The show can be performed by a smaller cast of 25 � 30 or by a very large cast in which the extra members are incorporated into the performance items. Within each scene there are a number of small speaking parts making for a great opportunity for children to have a bigger part in the performance of the show. The sets required are very minimal as the action primarily takes place in or around the palace. The settings for Scabiosa's house and the robbers' hideout can be established by the simple use of some coloured lighting. Hundred Year Rock is a show that teaches kids all about magic, history, the effects of the passage of time and the struggles we all encounter when growing up. Hundred Year Rock is a fabulous and funny fantasy which is very loosely based on the classic fairy tale, Sleeping Beauty. The kingdom's bad fairy, Scabiosa, is causing all sorts of trouble after she is not invited to the party to celebrate Princess Betty's birth. She decides to cast a spell which causes mayhem at Betty's 20th birthday and sends the whole kingdom to sleep. If a handsome prince isn't found within 100 years to kiss Betty and wake her from her slumber then they'll sleep forever! The kingdom's good fairy, Angelica, tries everything to save the kingdom and find a prince over the next 100 years while Scabiosa does all she can to make trouble. While Angelica is searching for a suitable prince a parade of terrific characters attempt to take over the palace while the royal family are sleeping. The handsome prince is found just in time and the fairies finally become friends as Angelica agrees to help Scabiosa learn to fly which seems to have been the cause of all her grumpiness! The tale finally has a happy ending when everyone awakens to a celebration one hundred years in the making. Hundred Year Rock can be performed with a smaller cast of 25 - 30 or by a very big cast with large groups involved in each song and dance number. The show consists primarily of 7 key story scenes and each of these scenes can be performed by a different grade or group. Within each part of the show there are small speaking parts for individual children. Each of the groups (party guests, police, robbers etc.) move off to make way for the next group while action continues with the lead characters upstage. The speaking roles and cameo roles (royal cook, dressmaker etc.) can be played by children within each group or by a core group of older children who appear in each scene playing these different parts. The first of the lead characters are the fairies, Angelica and Scabiosa. Angelica is a good fairy who is painfully prissy and a goody two shoes while Scabiosa loves causing trouble. Both of these roles call for strong actors with good senses of humour and strong singing voices. Along with the fairies there is the royal family and their staff. The king is well meaning but can be fussy while the queen is often prone to anxiety and causing a fuss. The character of Princess Betty needs a strong actor who can handle portraying the character as she ages from a 5 year old to a spoilt teenager. Horace is the family's butler who announces all of Betty's birthdays with a roll of the eyes. A group of characters that can be played by a single actor or by 4 is that of Betty's various suitors: Elvis, Prince Charming, a jockey and the handsome, motorcycle riding prince. During the course of the show there are also three narrators who tell the story of the search for the handsome prince. They must be able to sing as they lead the various songs that tell of Betty growing up. Along with these key speaking roles there are a number of other smaller speaking roles like Sergeant O'Toole, the chief of police and 7 chorus groups that appear in each scene.